Is that what inspired you to start playing music? When did music become something that you were going to do, as opposed to just something you listened to? When did you realise that you had a natural flair for the guitar? When did you start getting involved in the notorious 80s LA scene? What were those early bands like? Forget Coachella – what about new Guns N' Roses music? How did you meet Axl, Izzy and Duff? What was it like before the recording of Appetite For Destruction? Duff told us he had only expected the album to sell 40K copies. What were your expectations? Where was the lowest ebb with the drugs and alcohol? You’re a notorious ladies’ man, how many women do you think you’ve been with over the years? What are your lasting memories of the Use You Illusion era? 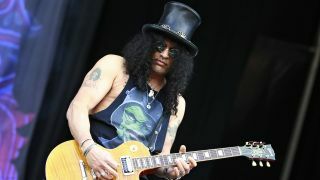 How and why did Slash’s Snakepit happen? Did you ever think Velvet Revolver would become this huge outfit it did? Do you think that’s the secret to your success? Doing everything very organically and intuitively? Is it annoying having aspects of your life played out in the press?